Saraswati Day is celebrated once every Balinese 210-day lunar year, taking the name from the Hindu goddess of knowledge, music, art, wisdom and learning. To pay tribute to the sacred day, the Balinese place offerings in temples and homes, and pray, asking for blessings for their holy texts, books, and any sources of knowledge and learning. The Balinese ceremony is celebrated twice a year according to the Balinese calendar. There are several meanings of Saraswati. The word Saraswati is derived from the words “sara” and “swaandthi,” which means the one who gave the core meaning, and the one who already knows. Saraswati can also be defined as the one that flows as a river of knowledge, which means that those who are willing to study and learn, will gain wealth and enlightenment within themselves. The goddess Saraswati is the symbol of knowledge as she controls thoughts and words. She is described as a beautiful woman who has 4 arms, and holds scriptures, rosary beads and plays a zither, each symbolizing a different meaning but is still connected to the characteristics of knowledge. Her beautiful face illustrates how interesting knowledge can be; the zither represents art; the scriptures show how knowledge can lead to enlightenment; and the rosary beads represent spirituality and dedication. Saraswati also sits or stands on a lotus leaf, with a goose and a peacock as means for transport. These also have significant meaning; the lotus leaf symbolizes that knowledge can be found in any given situation ; the goose represents that knowledge can be used to filter good and bad habits and the peacock represents beauty; together with the goose they become a vehicle to deliver knowledge given by god. Saraswati day is celebrated by the Balinese making offerings and praying, either at home, at school, at the office or at the temples. Offerings are also put on books and scriptures as they are the main sources of knowledge. At the temples or at home, the Balinese also celebrate it by praying and singing holy songs and spells from Hindu scriptures until late at night. Students usually learn about making offerings, singing holy songs, dancing traditional dances and any other religious activities before the Saraswati day so they are prepared and know what to do. 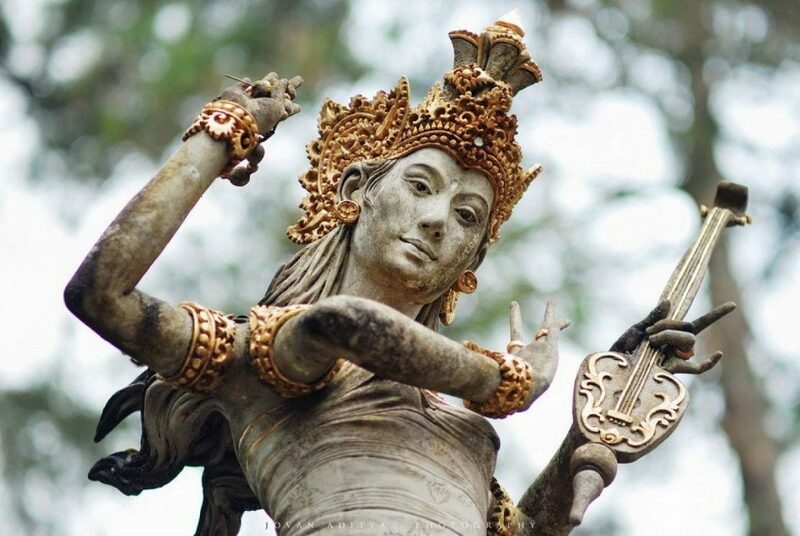 “Rahajeng rahina Saraswati!” – Happy Saraswati Day! May wisdom be in every human being.